PSHIFC made it to the news again! Actress Park Shin Hye unveils a gift certification photo on Twitter. "잠 별로 못자서 나사한쪽 풀린지금.. 여러분덕에 힘이 펄펄납니다!! 고마워요 PSH_IFC!!!!!!! 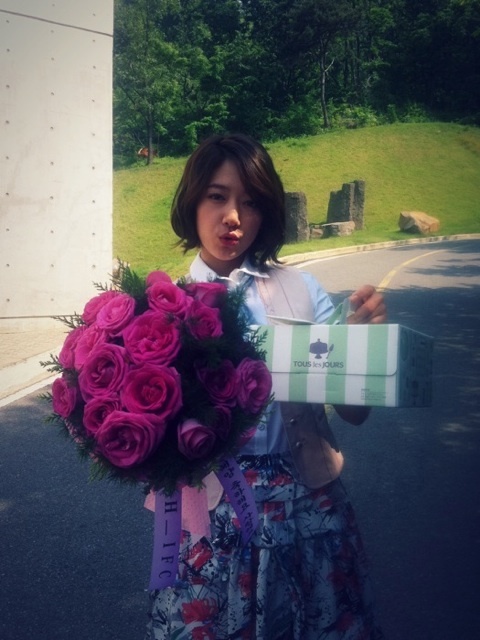 오늘도 힘내서 촬영할게요^^*"
In the photo Park Shin Hye holds a bouquet of flowers in one hand and a cake in the other. Although her face shows a few signs of fatigue, radiance still shines through her smile. Her positive energy invited a lot of welcoming comments from netizens, who tell the actress that she looks 'cute', 'shin hye-ssi you look good with flowers', and 'fighting!' etc. Shin Hye's new drama Heartstrings will begin broadcast on June 29. Answer: We sent a bouquet of flowers and a cake to Shin Hye on behalf of all PSHIFC members to congratulate her on her Paeksang Arts Awards win. #2 Summer Spree for Heartstrings. AWWWWWWWWWWWWWW to the max! I'm so proud to be Shin Hye's fan. Shin Hye fighting. We will always love and support you! Congratulations everyone!!! the flowers look so beautiful! tq shinhye..feels appreciated^^....luve u so much dear...fighting!! No it's our star necklace. Please click on the links at the bottom of the photos to see our post on the necklace. It was given to her by us for her birthday. i really love park shin hye especially her korean drama you're beautiful. Go park shin hye! go...go...go... star and fill the heavens of your light!